An important patient room accessory designed to help patients change positions while in bed with minimum attendant assistance. 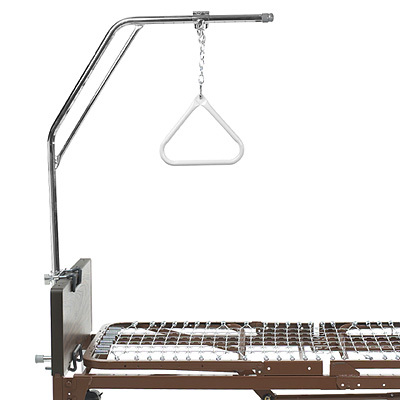 Invacare trapeze units have a wide range of height adjustments and handbar positions to maximize patient accessibility. The unit can be installed quickly and easily on an Invacare floor stand or on any Invacare Home Care bed end. Heavy-gauged octagon-steel construction with no tools required for an easy assembly. Nylon coating ensures a secure grip on handbar. Wall bumpers and padded mounting brackets protect bed ends and wall surfaces. For use on 7714P floor stand or on any Invacare home care bed end.